The origins of the London bollard is a good example of the "one-upmanship" nature of the relationship between the English and the French. After winning the battle of Trafalgar the English stripped the canons from the captured French war ships, only to discover that as they were bigger than the English model, the English navy couldn't use them. Determined to find a way to flaunt their victory, the enterprising English used them for street bollards in the east end. Even now the bollards you see around London streets are modelled on the French canons. Wow, that's one way of rubbing their noses in it huh?! I love the way you photographed this shot! Gosh - that's a bit macabre. But then so much of England's history is. I didn't know that! It seems pretty obvious now that it's been explained. That is a little bit of histrory that I didn't know. I love taking the "London Walks" walking tours. This is exactly the type of great information those guides pass on. That's awesome! I had never heard that before. Next time I'm there I'll look for them. This is a great photo with wonderful text. You posted a winner today! I love the street in the background - even complete with a pedestrian! Great shot. I don't think I have ever noticed those before! Great post! I love learning new things! Interesting story and wonderful shot. I really like the blue cast of the street and the red of the... French canon. Such an interesting bit of history! Well I never! Like I have said before - you learn something new everyday! Great photo and fantastic info! 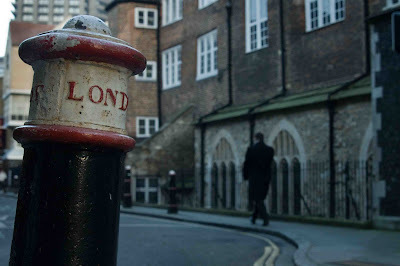 Interesting history of London's bollards to go with your fine photo. Thanks for sharing your take on London, Mo! Well I never knew that. Great shot and an eductaion. This is a really innovative shot. I like it a lot.